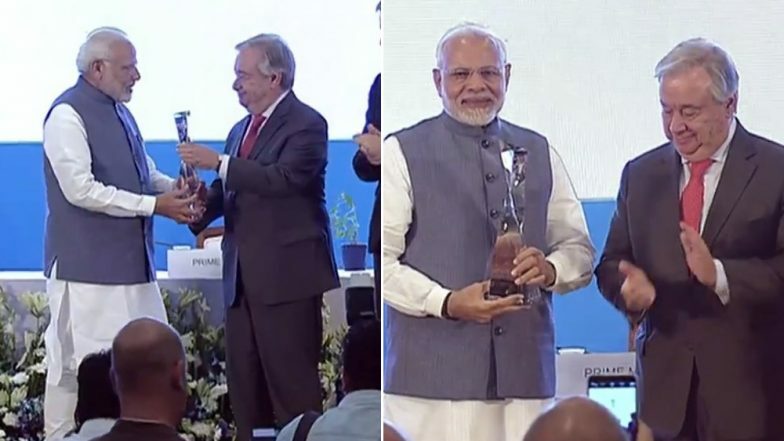 New Delhi, October 3: Prime Minister Narendra Modi on Wednesday received the United Nations' highest environmental honour 'Champions of The Earth Award' at a special ceremony in the Pravasi Bharatiya Kendra in New Delhi. The award was presented to the Prime Minister by the United Nations Secretary-General Antonio Guterres. PM Modi has been selected in the leadership category for his pioneering work in championing the International Solar Alliance and for his unprecedented pledge to eliminate all single-use plastic in India by 2022. While addressing the meet, Guterres praised the Prime Minister and said he not only recognizes the threat of climate change but also acts to find solutions, and that's the difference between him and other leaders. "PM Modi recognises climate change poses a direct existential threat to us. He knows what we need to do to avoid a catastrophe. Other leaders also recognise, know & understand, but the difference is that he not only recognizes but he acts", Guterres said. International Solar Alliance: PM Modi Lists 10 Action Points at Founding Conference. On receiving the award, the Prime Minister said Indians are committed to saving the environment and the award was an honour for all Indians. He said it is a tribute to our tribal brothers and sisters settled in the forests of India, who love forests more than their lives. The Prime Minister further added saying that the award is a commitment to the 100 million people of India for the protection of the environment. The award was announced on September 26 on the sidelines of 73rd UN General Assembly in New York. ''Under PM's leadership India today has 300 million LED lights, it's remarkable,'' said the Secretary-General of UN. It must be noted that 'Champions of the Earth Award', that is awarded annually, is given to outstanding leaders from government, civil society and the private sector whose actions "have had a positive impact on the environment". Prime Minister Narendra Modi and French President Emmanuel Macron were selected under the 'policy leadership' category for their pioneering work in promoting new areas of levels of cooperation on environmental action. Reports inform that the champions are recognised for their achievements in the categories including Policy Leadership, Entrepreneurial Vision, Science and Innovation, Inspiration and Action, and Lifetime Achievement".